Investigators with the National Transportation Safety Board examine the damaged engine on the Boeing 737-700 operated by Southwest Airlines that made an emergency landing at Philadelphia International Airport on Tuesday. 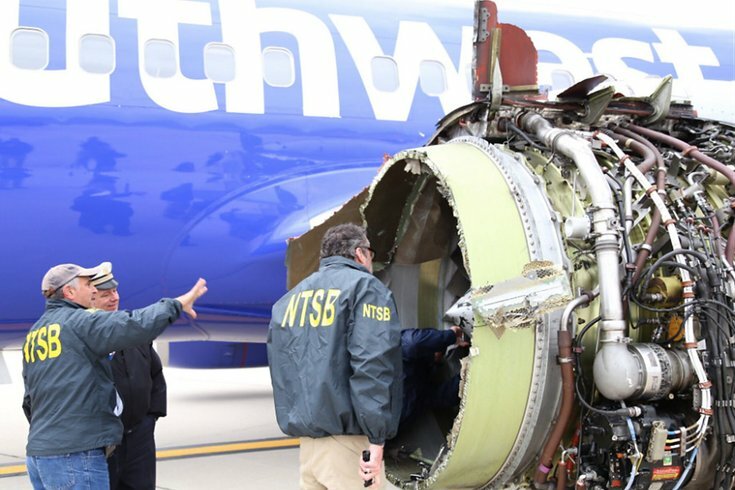 An examination of the blown engine on the Southwest Airlines Flight 1380 that made an emergency landing Tuesday in Philadelphia shows preliminary evidence of metal fatigue on a key part, according a National Transportation Safety Board official. According to Robert Sumwalt, NTSB chairman, a preliminary inspection of the engine on the ground at Philadelphia International Airport indicated one of the 24 fan blades on the engine – the No. 13 blade – was broken off at the hub and missing. It appeared from a visual inspection that metal fatigue was the cause, Sumwalt said during a news conference Tuesday night. Further testing would be necessary, he added. Sumwalt said another part of the No. 1 engine, the cowling, or engine covering, was found on the ground in Bernville, Berks County, about 60 miles northwest of Philadelphia. "There is much more to be done on this," Sumwalt said. Flight 1380 was diverted to Philadelphia International Airport shortly after its 10:30 a.m. takeoff from LaGuardia Airport in New York City. Destined for Love Field in Dallas, the plane instead headed for Philadelphia as it flew over Lebanon County, Pennsylvania, according to FlightRadar24.com. Sumwalt said the NTSB team on Wednesday will recreate a transcript from the cockpit voice recorder, which was analyzed in Washington, D.C., on Tuesday night. The full investigation of the accident would take 12-15 months, Sumwalt said. Jennifer Riordan of Albuquerque, a mother of two children, was identified by officials late Tuesday as the passenger who died. She was a vice president of community relations for Wells Fargo bank. She died of injuries sustained when a piece of the engine struck the aircraft, breaking a window, and she was nearly sucked out of the aircraft. 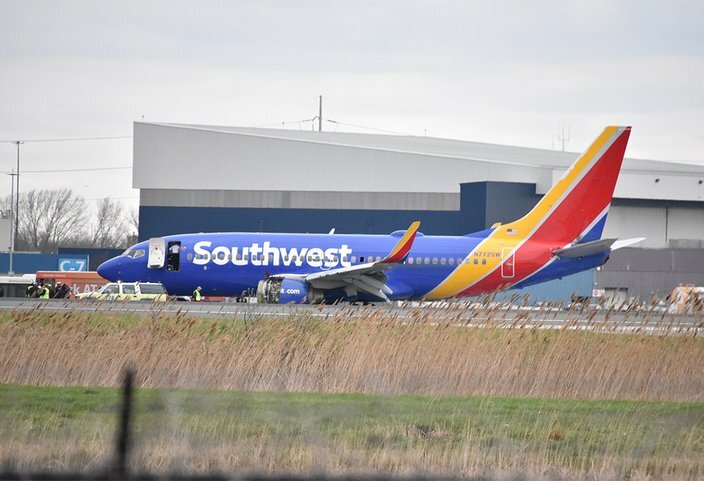 Sumwalt also said that Southwest CEO Gary C. Kelly told him on Tuesday night that his airline will immediately begin an "enhanced ultrasonic inspection" of its entire fleet. Southwest Airlines Flight 1380 sits on the tarmac after an emergency landing at Philadelphia International Airport. Passengers on social media told of a harrowing flight after a piece of an engine struck and broke a window. Sumwalt said the harrowing accident, at altitude, with a piece of the aircraft puncturing a hole in its skin, the depressurization of the cabin, and the fatal injuries suffered by a passenger, was unusual in aviation history. "I flew a 737 for 10 years ... [this accident was] very unusual," he said. "So we are taking this event extremely seriously. This should not happen. We want to find out why it happened so that we can make sure that preventive measures are put in place." Sumwalt said the issue of metal fatigue raises huge concerns for passenger safety and hinted that something far more tragic could have occurred in the skies over Pennsylvania. "We are very concerned about it," he said. "There needs to be proper inspection mechanisms in place to check for this before there is a catastrophic event."